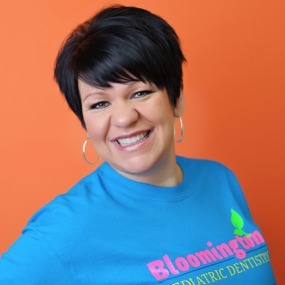 Bloomington Pediatric Dentistry was founded in 2001 by Dr. Kyle Taylor specializing in the comprehensive dental care of infants, children, adolescents and patients with special healthcare needs. When Dr. Taylor created Bloomington Pediatric Dentistry, he had a vision that would change how children in Southern Indiana received dental care. 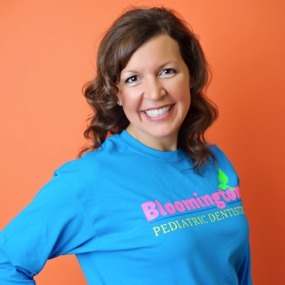 Bloomington Pediatric Dentistry was to be a state of the art, progressive practice using the most advanced treatment methods in a child centered environment. This approach was to include cutting edge digital radiography equipment so as to minimize each child’s exposure during radiographs. With his vision and expertise, Bloomington Pediatric Dentistry has successfully made that vision into a reality and added a few perks along the way. Dr. Taylor is very proud of the newly completed office and all it has to offer to the children and families of southern Indiana. Our doctors strive to always put the children first which is why they have made our new office into a magical remake of Jack and the Beanstalk, with the help of local painters Ruth, Cindy, and Cheryl Hester of Lettuce Paint. Our story begins as soon as you walk into our office – The “Floss and Brush Castle”. Both children and parents alike enjoy finding hidden items that are intricately painted on the walls relating to the story of Jack and the Beanstalk along with some healthy foods and other castle related items. These are all located in the “giant’s courtyard,” otherwise known as our waiting room! Throughout our castle, the storybook of beautiful art unravels in every room allowing the children to lose themselves in imagination. 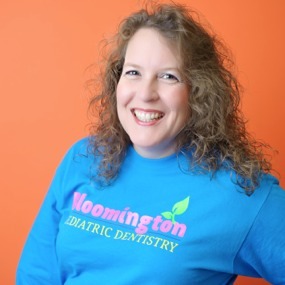 When Dr. Taylor was designing the original Bloomington Pediatric Dentistry space back in 2001, his goal was to have a kid friendly activity that would help the children get excited to come to the dentist and possibly ease the anxiety that most of them portray. The ‘’I Spy” concept was such a huge success, Dr. Taylor wanted that “magic” carried throughout the new space. Dr. Taylor and Dr. Devin Shone are very excited to see what the future holds for Bloomington Pediatric Dentistry. The doctors and staff will continue to work toward improving the oral health of the children in Southern Indiana by providing better access, streamlined care, and educational prevention.